You’ve been to a Costco, right? If you’ve ever been to a Costco and purchased two industrial-sized jugs of mayonnaise, or a hundred pack of tacquitos, or ten pounds of boneless chicken breast, you’ve experienced first-hand the advantage of buying in bulk. It is a truism that you will save money by buying bulk quantities of nearly anything. Just as it’s true for condiments and delicious Mexican finger foods, it’s true for wine. Nearly every wine retailer offers case discounts. For instance, if you were to purchase one bottle of wine, that bottle could cost $50. If, however, you were to buy a case of that same wine, most retailers would give you a 10-15% discount off the whole case. At a 10% discount a case of wine would be $540 (versus $600), or $45 per bottle. Unfortunately, most people don’t have $540 to drop on a case of wine, even if it is a discounted rate. Even if they did, most of those people wouldn’t be able to get through twelve bottles, or would not have the proper storage facilities. Hence, the power of a wine collective. If you read my blog you probably are aware of the concept of carbonic maceration. I won’t go into the technical details of it because I want to focus on one aspect of this process–namely, that some of the grapes at the bottom of the vat are crushed under the weight of all the other grapes and juice on top on them. I feel that way about this blog. The reason I feel this way about my blog is not because I don’t enjoy writing on my blog–nothing could be farther from the truth. The fact is, however, that I undertook to write a number of blog posts–reviews of wine I received, reviews of books I received, reviews of wine paraphernalia I received–at the close of the spring semester and haven’t yet gotten around to writing them. If you’re one of those fine, generous people who gave me things to review: I apologize sincerely! I will write and post my reviews very soon. Whew! With that out of the way I feel as if my soul can now be made into delicious, fruity (yet serious and profound) Beaujolais cru. I have been drinking a fair amount of wine during this second half of summer, what with my being in Wilmington, Delaware during the weekdays and DC during the weekends and all. I’ve had some fantastic aged Rully and some great Pinots. 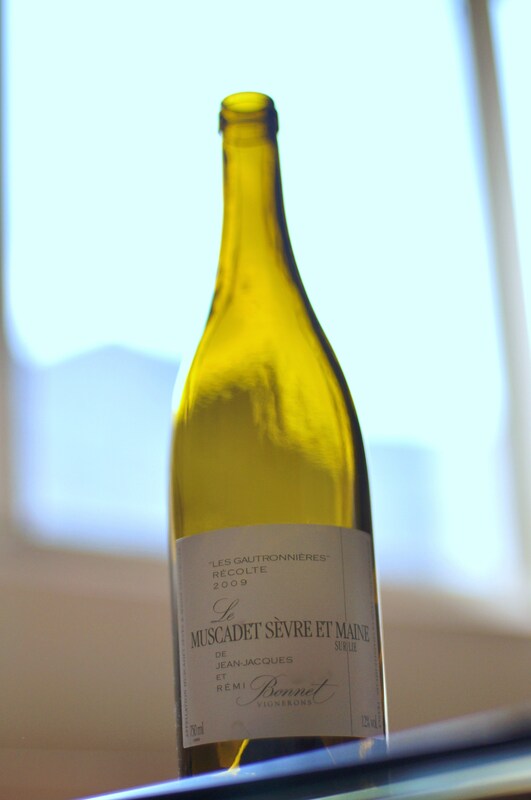 However, I want to devote this Phoenix of a post to a simple, inexpensive, but altogether ravishing white wine: the 2009 Bonnet-Huteau Muscadet Sèvre et Maine “Les Gautronnieres” ($11.99, available at Ansonia Wines and Weygandt Wines, both in DC).